Download Hour1 Download Hour2 This week, we conclude our adaption of The Seven Sisters and supplement it by the research of James Corbett on the influence of the US "Oiligarchs" over the rest of US society. As he notes, the US oil barons were effective in their takeover of other aspects of US society including the money, educational and food supply systems. 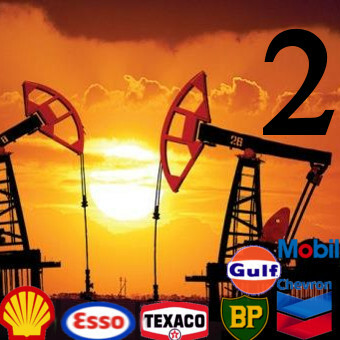 We begin this week with part two of the documentary from Al Jazeera, The Secrets of The Seven Sisters, about the oil industry. This focuses this week on the unconventional oil of Venezuela and the growing importance of China in the global struggle for oil. We conclude the show with our main piece this week, produced last month by James Corbett. Entitled "How Big Oil Conquered The World", if tells another history of big oil, this time not focused on the oil majors but the individuals (John D. Rockefeller in particular) and their growing influence over US society. As we hear, the immense profits of Standard oil were put to use to take control of the US financial system and later the US educational system (as we looked at a few years back in episode 538), and to take control of the food supply through Agribusiness and Genetic Engineering. This episode rebroadcasts content from 538. This page was last modified on 23 January 2016, at 08:22. This page has been accessed 15,841 times.